It is no secret that me and Jess both like to travel A-LOT! If it were possible I would definitely make travelling my occupation, I never grow tired of visiting new countries or learning about different cultures, I love to go on adventures and of course seeing the wildlife is my all time favourite thing to do, whatever country I am in. Everything about travelling excites me, the packing, the flights, the food, the people, the smells and the sights, so when Carrier asked me to list my 10 top favourite unique hotels from anywhere in the world I jumped at the chance to explore. There are so many places I would love to see but there are also lots of places I have already had the pleasure of visiting, some of which I just had to include here. If you are anything like me you will be determined to use your honeymoon as a good excuse to have the trip of a lifetime so you simply must take a look at this list, it certainly has the ‘wow’ factor! I was lucky enough to visit Sweden for the first time for my birthday last year. It really is magical and has to be one of the most beautiful countries in the world! I fell in love with the quaint streets of old Stockholm and the home interiors and decor are to-die-for. Ever since I came back I have been on a mission to make my home more Scandinavian and I would fly back there in a heartbeat! Although I never got to see the Ice hotel myself, it is easy to see why I would choose it as one of my top favourites. 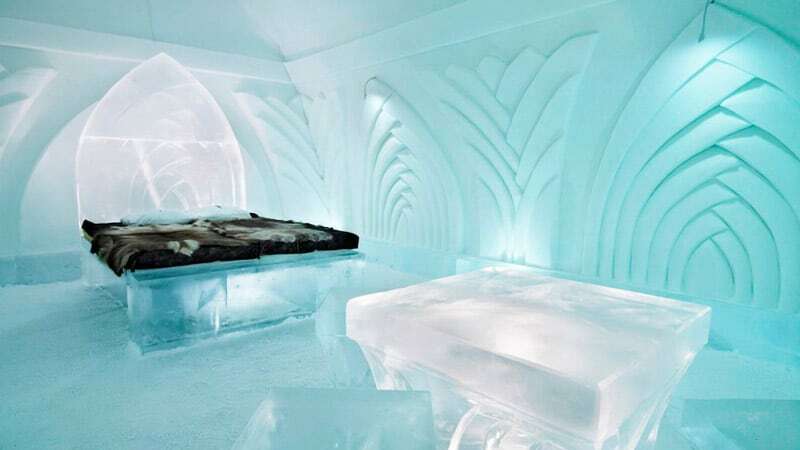 It’s not every day you get to visit a hotel made entirely out of snow and ice and I have heard that the art and design there is phenomenal. Every year they invite different artists to design specific areas of the hotel, it is totally unique and can only be viewed between December and April. After that the snow starts to melt and all traces of the hotel are gone until the following year. Not many people know this but I have a secret little fetish for vintage trains, most probably inspired by the old movies that I used to sit and watch with my Nan, if you haven’t heard of ‘Murder on the Orient Express’ then where have you been? There is something so glamorous about those trains, even if some poor soul did always turn up dead! It has long been a dream of mine to travel in the style of an old Hollywood starlet, surrounded by opulent interiors and sparkling crystal, relaxing in my own cabin, eating a delicious dinner as I look out over exciting new horizons. The Venice Simplon Orient Express would be the perfect way to travel and with trains all over, the world really would be your oyster. Seeing the spectacular Northern Lights in Iceland has always been on my bucket list and what better way to do it then setting up in a luxury camp wherever you want, whether it be be it on a glacier, in a lava field, overlooking a black sand beach or by a raging waterfall. Before you think I am crazy for wanting to camp in freezing cold temperatures, these are no ordinary tents. The camp is set up prior to your arrival and is complete with wooden floor, cosy bed, heaters, lights and toilet facilities. The camp even comes with its very own chef who will prepare a hearty gourmet cuisine, how romantic! I have always wanted to go on a cruise but as I was on a search for unique honeymoon hotels any old cruise ship just wouldn’t do, until I found this is a charming traditional Turkish Gulet. This luxury schooner offers three different journeys up and down the Lycian Coast, where you can experience ancient cities, luscious lagoons and dramatic landscapes. This is definitely one for the voyagers amongst you! I was introduced to the wonder of boutique hotels just a few months ago and I can honestly say it rated as one of the best hotels I have ever had the pleasure of staying in. That being said I wanted to make sure a boutique hotel made it on this list and it wasn’t difficult to decide which one. The Cobblers Cove has everything you could ever possibly want from a honeymoon hotel, it’s cool, private, calm, set amongst lush tropical gardens, oh and did I mention its pink! If you are anything like me you will love nothing more than using your holiday to relax, laze by the pool and catch a tan whilst sipping on delectable cocktails, however I fully appreciate that that isn’t everyone’s cup of tea, so I wanted to find a hotel that had a little of something for everyone. Carlisle Bay does just that, you have the option to relax by the pool, take a guided nature walk, enjoy non-motorised water sports and play tennis. If that doesn’t sound like enough how about diving or taking a three night sailing course? See I told you there was something for everyone! Hands down Borneo will always be my favourite destination and holds a very special place in my heart. Five years ago I made the trip with a group of friends that I met at college and it was honestly the best time of my life. To me Borneo is more than just a place to holiday, it is a place to make discoveries, explore and interact with the natural world. I will never forget hearing the call of an elephant in the wild, my first sighting of an Orangutan in its natural habitat and watching baby turtles making their journeys into the sea for the first time. If I were to go back I would definitely have stay at the Gaya Island Resort, nestled in the hillside of an ancient rainforest with a stunning outline of Mount Kinabalu on the horizon and only accessible by boat, this hotel is surrounded by Coral Reefs and protected Mangroves and allows visitors the chance of an intimate moment with nature. An experience that is truly Borneo! If you are looking for a hotel with a unique landscape, then this is the hotel for you! The resort is tucked into a protected valley with sweeping views towards the Grand Staircase – Escalante National Monument. The hotel is built around a central swimming pool which blends into dramatic surrounds with deep canyons and towering plateaus. I would be in my element here and of all the places on my list this is the one I would want to see the most, it looks amazing beyond belief! No hotel list would be complete without one of Richard Branson’s hotels making an appearance. He is renowned for having some of the very best hotels in the world and I assure you this one will not disappoint! Ulusaba would literally see my dreams come true! It is every naturalist’s dream to have the opportunity to go on Safari in Africa; it is home to the famous big 5 after all. However this hotel really does go above and beyond and I am going to make it my mission to make sure I see this place at least once in my lifetime. The hotel boasts two different lodges; Rock Lodge is carved into a natural rock face eight hundred feet above the reserve, offering dramatic views and linked by a network of wooden walkways. Safari Lodge is hidden away in the heart of the African bush, swing bridges linking the exquisite tree house rooms, each with private deck and bathtub looking out over the bushveld. If you ever have the chance to visit you must tell me all about! Last but not least, I couldn’t leave my top ten without another of my favourite destinations Mexico! Myself and Mr T vacated in Playa Del Carmen, the hub of the Riviera Maya a couple of years ago and it was utterly fantastic – Like a little slice of tropical heaven! I love nothing more than to relax on holiday but I couldn’t pass up the opportunity to drink in some of the culture with a trip to Chichen Itza, probably the most famous Mayan Ruin in the world and a day full of snorkelling, swimming and wildlife at Xcaret Park. If you get the chance you must go for a dip in one of the many cenotes in Mexico, I was completely mesmerized by such a beautiful natural phenomena! Mexico hosts some of the most luxurious hotels I have ever seen and trip here is not complete without staying at the Banyan Tree Mayakoba. Immersed in untouched nature and surrounded by beautiful coral reefs, this hotel promises that you will experience the ‘Romance of Travel’. I think it goes without saying that we would love to hear from you if you have had the opportunity to visit any of these amazing places, perhaps we have even helped inspire your honeymoon? Carrier has 30 years’ experience in luxury tailor-made holidays worldwide and has firmly established its reputation as one of the leaders in the luxury holiday market. Travel is their passion and they know that to travel is to make aspirations come true. For more information on any of the hotels mentioned visit their website.